Mike put up this story earlier today about the letter Ian Duncan Smith had written, whining about the ‘outrageous claims’ Mike and other bloggers had made about his reforms causing the deaths of the poor and disabled. It seemed for a moment it had mysteriously disappeared. In fact, this seems to have been something of a false alarm. One of Mike’s commenters, however, states that it had vanished, only to reappear on the Commons Work and Pensions website. I’ve blogged several times about the way the Spurious Major gallops away at high speed, whenever it looks like he might have meet his opponents. The minister for chequebook genocide simply can’t stop himself. He’s hidden in laundry baskets, run out of the rear entrance in Job Centres, and spoken at early hours of the morning at Tory-run job fairs in order to avoid the angry Great Unwashed. And when he was forced to face the disabled and their carers in the public gallery in parliament at a meeting of the Commons’ Work and Pensions Committee, this mighty general in the tradition of Wellington, Mark Anthony, Julius Caesar and Henry IV, surrounded himself with armed goons. Now it seems even cyberspace is not safe from his cowardice. He’s starting to run away from people there. Of course, the Tories have form for this kind of thing. Some of us can still remember how a paragraph in one of the papers, written by a leading Tory, which lauded the motto on the gates of Auschwitz, Arbeit Macht Frei, ‘Work Makes You Free’, mysteriously disappeared after someone realised that it made them look like what they are: Nazis. Just that they don’t have the stormtroopers and the jackboots just yet, although no doubt aIDS is working on the forced labour camps. They’ve certainly set up their own system of secret courts, under which you may not even be told under what law you’re charged if this is deemed to be against ‘national security’. We are heading to the old Nazi strategy of Nacht und Nebel – ‘night and fog’, the mysterious disappearance of dissidents. And like the Spurious Major, Himmler was also not nearly half as tough as he made himself out to be. When he attended an execution by firing squad, he had to be carried away, hysterical. IDS also shows that he wants to run away as from shame and personal danger as possible, even when its Virtual. Hope Not Hate have just posted another piece reporting the racist, Islamophobic and anti-gay comments of another Kipper candidate on his Facebook page. This time, the prospective politico is Alan Harris, the party’s candidate for Oxford West and Abingdon. In addition to his candidacy, Harris is also the chairman of the Kipper’s branch in West Oxford. The article contains screenshots from Harris’ Facebook page in which he claims that ‘f****ing Muslims’ object to British culture, like bacon sandwiches; objects to Morrison’s in London for refusing to sell poppies in case it offends Muslims; and claims that Romanians and Bulgarians are only here for the job centres, and are responsible for robbery on the tube. He also asks the rhetorical question why he can’t say in his own country that black is a colour, and gays are ‘queers’. He also shares a story posted last year by the Bolton branch of the BNP. The article questions whether Morrison’s in London actually did refuse to sell poppies. As for ‘black’ not being a colour, I’ve heard that someone, somewhere, has made a loony pronouncement like this, but it ain’t general. As for not referring to gay people as ‘queers’, well, not only is it Harris’ country, it’s also theirs. And like everyone else, they have a right not to be sneered at. Even so, some gays have adopted ‘queer’ as an attempt to reclaim the word. As for Harris, it appears that he just another prejudiced Kipper with a hatred of Muslims and gays, and inclinations towards the Far Right. Like so many others. I’m starting to wonder if there’s anybody in Farage’s little army, who isn’t a BNP-lite stormtrooper. At the moment it appears that there’s so many of them, pretty soon Hope Not Hate will be just doing articles on the entire membership, one by one. Private Eye also has a piece in their ‘In the Back’ column criticising IDS’ flagship Universal Credit. It reports that the Minister for Chequebook Genocide has announced that people on UC have been found to be five per cent more likely to find work within four months. The Eye states that the people lucky enough to qualify for the benefit comprise less than one per cent of the seven million, who will be subject to the new benefit. The article also notes that it’s only been implemented in a small number of areas and given to people with straightforward needs and uncomplicated claims. The Eye also states that what was not mentioned, when IDS announced it would be rolled out across England, Wales and Scotland by 2016 was how few would qualify for the benefit. *A person earning more than £80 a week/ £300 a month. * People, who own their own homes. * The homeless, or people living in temporary accommodation. * People with disabled, adopted or foster children. * Those caring for others with a health condition or disability. * Those who either themselves or their partner, are already claiming the benefits that UC is designed to replace have also been told they ‘cannot make a claim yet’. Some of the other criteria vary from place to place, with some only giving the new benefit to single people. ‘The roll-out is a complete sham. Most of our clients, who we would expect to claim Universal Credit, cannot do so at present because of the ‘knock-out’ criteria, serious disadvantaging people who face in-work poverty’. The lady gave as examples two cases of single people, who worked part-time. They would have been better off by about £40 a week – an increase of 50 per cent – if they were able to claim Universal Credit to top up their incomes. The article makes clear that Universal Credit is a farce. It’s not designed to support the poor, sick, disabled and unemployed, but to deny them that support under the guise that it’s really encouraging them to find a job. Mike’s already estimated that about 50,000 plus people are dying a year thanks to IDS wretched sanctions system. If UC gets rolled out next year, the number dying will be much, much higher. Not that the public’ll know, as the stats will be doctored and the deaths unreported. 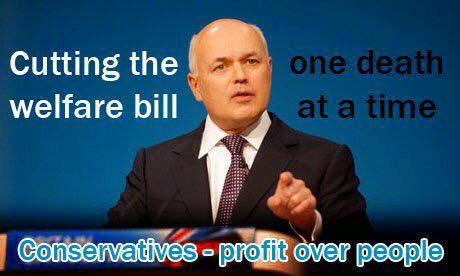 All so IDS can live in his fantasy of claiming he’s got the poor into work, while satisfying his lust for blood.